How Kalevipoeg formed the landscape of Haanja land. Kalevipoeg (Kalev’s son) – I don’t know where he was coming from, perhaps from Pskov, but he didn’t have the boards with him – was tired and wanted to lay down, but the ground under the head was too flat. So he scooped from left side and the right and so there was Munamägi (Egg Mountain). As the flies and horseflies were buzzing around, he turned from side to side and so the Vaskna Lake was made. Then he got up and the first step he made was Tuulijärv (The Tuuli Lake) and the second one was Tuhkrijärv (The Tuhkri Lake). It has been tried a long time ago to build a building on the top of Munamägi that would open a view far from the mountain. In 1812, in the days of the war soldiers under the leadership of the Russian officer built the first tower of Munamägi. They say it was so high that ships on the sea got confused and therefore the tower was torn down. Fr.R. Kreutzwald mentiones in his letters to F.G. Struwe, that the triangulation tower that was built in 1816 to measure Liivimaa. The older generation of Haanja village remember the 8 meters high tower that was built in 1870 by the local pub owner in his own interest. People started to visit Munamägi and the beer-vodka business was good. However the tower that could take four-five persons at once became too small for visitors and the trees were blocking the view. The brightest minds of Haanja under the leadership of Juhan Kolga started to build higher tower. The building was supported by the lessee of Haanja mansion Jaan Sprenk. New tower was 12 meters high. 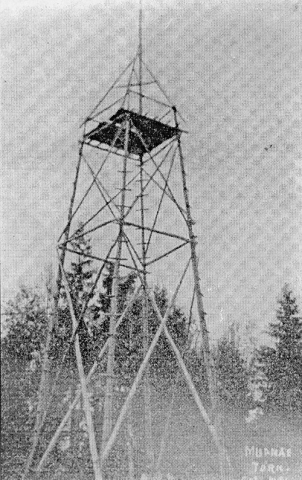 In 1925 Võru County Government in assistance of The Main Government of Forests started to build new tower. New tower was 17 meters high and it was built in 3 months. The surrounding of the tower was also taken care of: first pedestrian paths were made, the forest was cleaned and benches were placed before the tower. 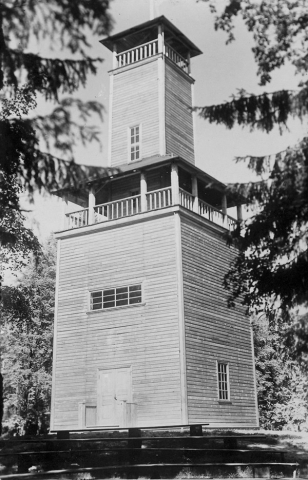 The observation tower was festively opened on the July 19th 1925. Soon it was clear that the tower made from wood is still going to be too low. New, the fifth tower, was to be made from reinforced concrete. The construction works were guided by the engineer Mägi of Võru County Government. 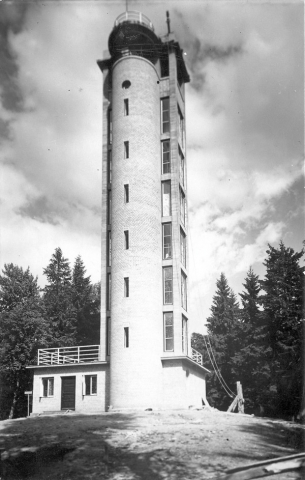 New observation tower was 25,7 meters high and ready to use in 1939. the construction of the tower required 36 000 bricks, 120 m³ of field stones, 265 m³ of gravel, 75 m³ of flintstone that was made on the spot, 80 tons of cement and 110 m³ of water that had to be transported to the mountain, too. The wood for stocks were taken from Munamägi and Vällamägi, the boards were sawed in Võru and Sänna sawmills. The main construction works were finished by June 1939. The opening festivities were cancelled because of the serious situation in Europe and Estonia. The tower was not seriously harmed in war and the repair was made in 1955. The Memorial Museum of Fr.R. Kreutzwald that was at that time the owner of the tower, started to modernize the tower and fix it’s surroundings. In 1969 museum built an additional floor on the top of the tower and changed the construction of the stairway on the top floors. The add-on was engineered by Toomas Rein and Veljo Kaasik. The tower was now 29,1 meters high. The view from the height of 346,7 meters is 50 km in radius. The renovation project of the tower was started in 1998 by Haanja parish. In 1999-2000 Toomas Rein made the renovation project. In 2002 the piping of the tower was engineered and completed next year. From August 2004 to July 2005 the major renovation works were made on Suur Munamägi: the observation tower was renovated, the tower’s elevator and glass café were built, the paths to the tower re-made, the lightning of the pedestrian’s path and the tower was made. The total cost of the works was ca 10 million kroons. The construction was financed by EU Phare program, Enterprise Estonia, Estonian Government, Environmental Investment Centre, private supporters and the budget of the parish. On July 24th 2005 the renovated observation tower of Suur Munamägi was festively opened.